Directions: Read the summary below, watch the Facebook Live interview and answer the discussion questions. If time is an issue, choose the questions that work best for your class. Summary: On Saturday, a video sparked outrage online showing a confrontation between Covington Catholic High School student Nick Sandmann and his classmates, and Omaha Nation elder Nathan Phillips on Friday at the Lincoln Memorial in Washington D.C. The students, many of whom wore “Make America Great Again” hats, gestured toward Phillips by making tomahawk chopping motions, while Sandmann stood directly in front of Phillips, smiling. Phillips faced off with Sandmann and the other students while chanting and playing a drum. The Roman Catholic Diocese of Covington and Covington Catholic High School issued a joint statement over the weekend apologizing for the incident, saying the students may be punished if any wrongdoing was determined. Video: Watch NewsHour’s Facebook Live interview with Indian Country Today’s Mark Trahant and Jourdan Bennett-Begaye, on how we should look for the teachable moments and opportunities to build bridges between different communities. 1. Essential question: One aspect of media literacy focuses on looking at multiple sides of a story, hearing different perspectives and allowing constructive conversations to follow. The National Association for Media Literacy Education (NAMLE) defines media literacy as the ability to access, analyze, evaluate, create and act using all forms of communication. What are some media literacy strategies you can use when it comes to understanding current events and issues? 2. What factors have made the struggle for civil rights in America difficult? 3. Check out the coverage the PBS NewsHour has done on the incident with Covington Catholic students. Type in “Covington Catholic” or “Nathan Phillips” using the search tool in the top right corner (it looks like a magnifying glass–to double-check your search, you may also want to put the subject and the news outlet into an internet search engine.) Note: Like many news organizations, the PBS NewsHour uses the Associated Press (AP) wire service. How many stories do you see? Are they by the AP or NewsHour journalists? What are the news headlines? What pictures do you see? Who did the journalists interview? What did you learn about the events? 4. Choose at least three other news outlets from a variety of perspectives and put the search terms in question #4 into an internet search engine (suggestions: Fox News, Indian Country Today, Washington Post, Democracy Now!, Wall Street Journal). How many stories do you see? What are the news headlines? What pictures do you see? Who did the writer interview? How many direct quotes are incorporated into the story? Are multiple viewpoints included in the pieces? Although it may take extra time to learn about an issue, why is it important to read a variety of news sources? b. Next, think about why you have social studies class and study history. If you’re not sure, this is a good question to think about on your own and engage in with your teachers and parents. One key aspect of learning about history and cultures is understanding symbols. Sometimes the same symbol can have different meanings in different parts of the world. Example 1: Several of the Covington High School students who attended a March for Life rally against abortion on Friday wore “Make America Great Again” (MAGA) hats. The hats were seen throughout President Donald Trump’s campaign and remain a key symbol of support for Trump today. Find out the origins of Trump’s MAGA slogan and why he chose it. What other symbols do people use to show their political beliefs? Why are symbols powerful? Example 2: Now find out about the significance of the drum in Native American culture. Be aware that there are many different Native American tribes, and while the main idea may be similar among tribes, it’s important to know specific reasons why the drum is an important symbol. One of the songs Nathan Phillips sang during the incident with the students was a song of the American Indian Movement (AIM). You can hear a performance of the song here. Why is singing an important part of Native American culture? If you’re not sure, how could you find out? 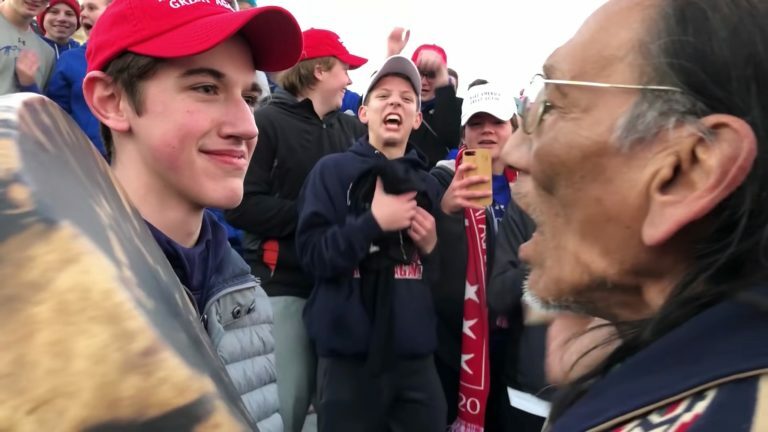 *Teacher’s Note: Context can help provide some understanding around an issue, but you would have to conduct research using a variety of sources to get a fuller picture of subjects like the American Indian Movement or political symbols like the MAGA hats. One of the goals of media literacy is to spark a curiosity in people, so that they can ask more questions and go out in search of the answers. 5. One of the Covington Catholic High School’s parent chaperones Jill Hamlin told Fox News, “I think they were targeted for what they stood for … which is Christianity, the right for life,” adding, “And they were singled out, and I believe, partially because of the color of their skin they were targeted.” What questions should reporters ask the chaperones? What actions do you think the teacher and parent chaperones could have taken to avoid the situation from developing in the first place? a. Racism has a long, complicated history in the United States of America. What do you know about the Catholic Church’s treatment of indigenous people? How could you find out if you are not sure? Start with recent history–In 2015, Pope Francis asked forgiveness for the “many grave sins” committed against native peoples of Latin America during colonial times. He also commended Latin Americans for having fought to gain their independence from colonial powers. b. Media literacy often connects to the concept of empathy. (Psychology Today defines empathy as: “the experience of understanding another person’s condition from their perspective. You place yourself in their shoes and feel what they are feeling.”) Can you have empathy with a person but disagree with their viewpoint? Did you feel empathy with Jill Hamlin and/or Nick Sandmann and/or Nathan Phillips? Explain your responses. a. It may be the case that people don’t realize they are appropriating a symbol or aspect of another culture. How could you find out, if you are not sure? Under what circumstances could it be a meaningful opportunity to learn about and join in another culture’s tradition? How is cultural appropriation different than appreciation? Explain your answer. 7. Martin Luther King Jr. Day was celebrated on Monday, Jan. 21. What did your school do to celebrate Dr. King’s life? In what way does the incident between Covington High School students, Nathan Phillips and those participating in the Indigenous People’s March and the Black Hebrew Israelites highlight historical events and divisions? In what ways might the incident create learning opportunities around issues of social justice? 8. What does democracy mean to you? What kind of democracy do you want to live in? 9. Social scientists have studied the use and effects of social media on our mental health for several years, but it remains a relatively new communication tool in society. What role did social media play in Friday’s incident? 10. By looking at the media’s coverage of the incident, were there any important lessons about history, culture or humanity lost in the ongoing conversation? 11. Have you heard of the term “activism”? What about “civic engagement”? What do these terms mean? What do they have in common, and how are they different from each other? More than 200 Covington Catholic High School boys took part in the anti-abortion March for Life in D.C. A decade ago, reporter Vincent Schilling of Indian Country Today first reported on Nathan Phillips’ involvement holding an annual ceremony honoring Native American veterans at Virginia’s Arlington National Cemetery. Are these examples of civic engagement or activism or both? Have there been times when you have stood up for something you believed in? What was the experience like? a. Do you think Native American history and modern day civil rights issues for Native Americans are well-represented in high school history and civics classes? 1. Watch this interview with NewsHour’s Charlayne Hunter-Gault who sits down with one of the Rev. Martin Luther King Jr.’s closest friends, artist and activist Harry Belafonte, who remembers how they met and what made King so special, as well as why he says America is more racially divided than any other moment in his life. Follow along with the transcript here. What or who do you think gave King his sense of moral justice? 2. Watch the video below with the NewsHour’s Judy Woodruff, featuring four voices who have been involved in the civil rights movement. Follow along with the transcript to help you. Activist Brittany Packnett said it’s important to remember that freedom work will always be more important than it is popular. “Dr. King was terribly unpopular when he was actually performing his work, despite the conversation that we have about him now.” Why do you think this was the case? Can you think of leaders today who may also be unpopular, but who are doing important work?